Models wearing space-themed Chanel outfits pose beneath a mock rocket on the runway during the Paris Fashion Week Womenswear Fall/Winter 2017/2018 show on March 7. 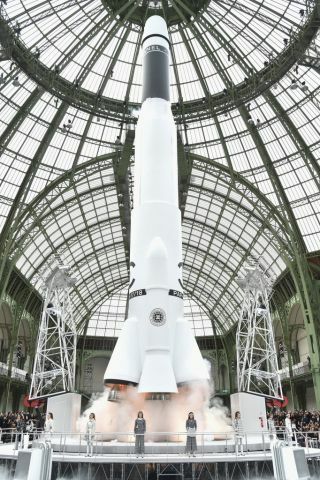 Chanel launched a line of interstellar fashion — and a custom Chanel rocket — at Paris Fashion Week on Tuesday (March 7). Chanel's shiny new line of space fashion might not make for the most practical astronaut wardrobe, but you can bet that the price tags will likely be astronomical.